The recent killing of the lowland gorilla Harambe, due to a child falling into his home, has been causing tensions to flare from different sides. Everyone seems to agree that is was a tragedy that this gorilla was killed for doing nothing more than minding his own business in the home he was placed in. The kid fell into the gorillas house, likely in part as a result of faulty parenting. But many think the gorilla was going beyond the call of duty and was actually trying to protect the child. And for that he ends up getting killed. He was 5-years-old and fell 20 feet into the gorilla pit. Seven foot Jambo came to look at what happened, and the big silver back male stood over the boy to protect him and keep other gorillas away. He even stroked the boys back. The boy came to, started screaming, and at this point the gorilla backed off, allowing zoo workers to help the child. Levan has recently spoken out regarding the shooting, and he does believe that despite his own experience, and the tragedy of what happened here, the right decision was made. “I know what it’s like to come face to face with an enormous gorilla – absolutely terrifying. But my experience taught me they are also incredibly caring. Watching the American video brought it all back. I felt for the boy but also felt for the gorilla. Did they have to kill it? Well, he wouldn’t have known his own strength compared to a child, having lived in captivity and never touched a human infant. And he does grab the boy and drags him into the water at a terrifying speed. The four-year-old is tiny and could easily have been injured. So they made the correct decision to save the boy’s life. The gorilla that Levan encountered was the first male to be born into captivity. He ended up passing away in 1992. Levan unveiled a bronze statue in Jambo’s honor. Very interesting perspective from someone who has literally been there before. 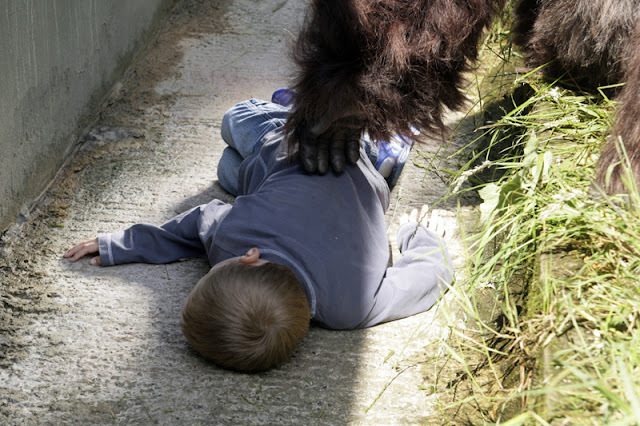 The apes own strength should be taken into consideration as even if he was dragging him to safety the boy could have been killed by the ape in the process. Still, a major tragedy any way you slice it. Share this story and see what others think about this latest opinion from a guy who was in the same situation.